After the successful launch of Pasta House AW Kitchen by Akira Watanabe at Plaza Senayan, the eatery opened its second outlet at the second floor of Plaza Indonesia. Not only serving the best dishes for patrons, AW Kitchen also launched an array of new signature cocktails, courtesy of mixologist and founder of Jakarta Bar Kingdom, Alexandr Afrikanov. Considered more as an aperitif, this cocktail is a mix of gin, vermouth rosso, campari with wasabi sauce and orange peel as the garnish. This special cocktail is made out of homemade ingredients such as dried fruit syrup with rum, infused with dried fruits, dry vermouth, compote and lime juice. This one is a dessert cocktail. 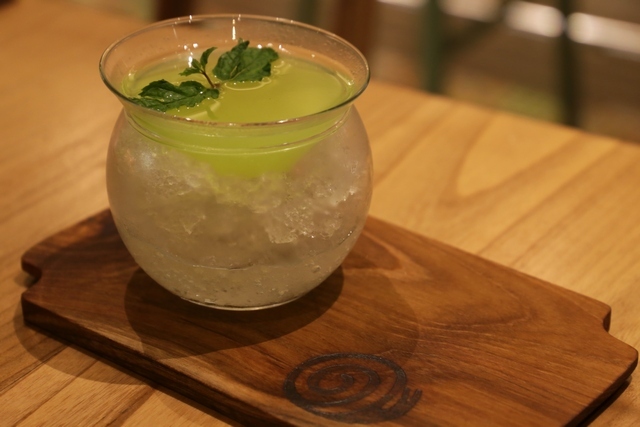 A typical Japanese cocktail consists of equal parts of green midori, vodka and melon juice. To balance the overall taste, the cocktail also add sugar and fresh lime juice. A perfect co balanced with sugar and fresh lime juice. A special cocktail with homemade rosemary syrup and gin. To top it off, it’s a foamy cocktail with hints of fresh apple and fresh lime juice.